Wardrobe proposal for a June week in Iceland – Let Us Live Like We Mean It! I’ve been working on gathering the many layers that are recommended for Iceland’s always-changing weather, keeping in mind that the average June high is 52-55 degrees F with lows averaging 40 degrees F. And that of June’s 30 days, usually 15 have no rain. My old Columbia rain jacket, mid-thigh length, no thermal lining, but a hood and tested for true waterproofing and breathability. Columbia rain coat and Cabela Club peaked hat for keeping rain off my face. I’ll try one pair of the Eddie Bauer Incline pants as soon as we have a good rain here. They have a life-long guarantee for satisfaction. I like that, especially since there is a warehouse outlet store ten minutes from me where I can shop or return even online-purchased items! The incline pants are a breeze to put on–they are pullups. And they have great pockets, all of which are large enough for my Samsung Android phone! Eddie Bauer Women’s Incline pants–mine are in dark gray instead of black. The Incline pants are also windproof, which I’ve heard is important, but they are not thermal, so I’m including 3 pairs of base layer footless tights for my legs, two lightweight, and one medium-weight. They are by Paradox and also by Duofold. Then wool and wool-blend hiking socks, in all three weights. Most of these I already had, since I hike a lot. Footwear is so vital. 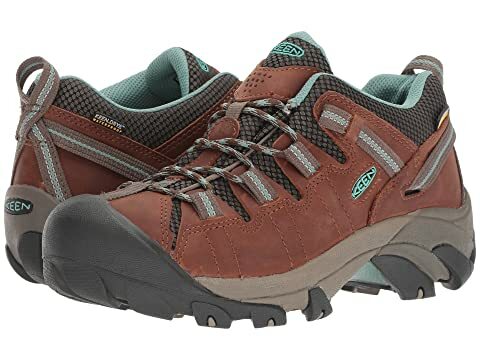 I was going to spring for a new pair of Keen Targhee II Waterproof Low Hiking Boots, because I’ve loved my previous pairs so much. But the ones I’ve ordered simply don’t fit, even when I try slight sizing changes. This year’s model of Keen Women’s Targhee II Low Waterproof boots, from a merchant’s site. I tried them in two different sizes, but they just don’t fit like the old ones did, alas! My old Keen Targhees are so honored that they get to sit on my bed, even after being worn on the trail! I’ll baby my old Keens through this winter so that they’ll have enough tread and laces in June. I’d love to take two pairs of hiking boots with me, but that’s just not going to happen…. Then I’ll also take a pair of sneakers, probably some New Balance ones that I already have. My feet are so hard to fit that when I find shoes that work, I usually stick with them until they totally give out. So once again, I’ll try not to wear my New Balance sneakers too much between now and June, in the interests of having them available for the trip. I think two pairs of shoes, plus flip-flops for swimming and maybe slippers, will be it for footwear. My old puffer jacket covered with ski caps, a scarf, black windproof gloves and Columbia waterproof gloves. For the thin base layer on top, under the fleece and rain layers, I’m going with technical active-wear in order to keep both warm and dry. I’ll take my two old Nike long-sleeve tops with zip necks. The other advantage to this tech gear is that it all dries very quickly, whether from washing in a basin or getting soaked in the Iceland rain or my sweat as I hike. And it packs down much better than cotton does. I may be able to use my base layers as pajamas. I’ll check that out. I got a really inexpensive, nice, big microfiber towel for using at the pools and spas, and after showering at the hostels. It will dry quickly. I’ll try its drying time out and if necessary get a second one. It folds up very thin and comes with its own waterproof pouch (except for one corner which is mesh so that it doesn’t have a chance to mildew). Finally, I’ll be taking with me a couple pairs, at least, of gloves (driving gloves, wind-proof gloves, and water-proof gloves, all of which I already have, except for the driving gloves), and a couple warm ski-type hats, as well as a truly warm scarf or two. The wind in Iceland is supposed to be pretty ferocious, and I am prone to earaches. When I lived in San Francisco, the wind there always made my ears hurt and consequently I always wore ski hats. It’s really helpful to see how people are dressed in YouTube videos of their trips to Iceland, and to read packing tips and lists on blogs of travelers, as well as Iceland’s own public tourist-agency sites, of which there are a plethora. Although some sites recommend bringing one fashionable outfit, complete with shoes, I won’t be doing that because I don’t plan to go out to eat at any fancy restaurants or hit the trendy Reykjavik bar scene. Next Next post: But will it all fit in my suitcase? That sounds very fun and like you’ve really thought about it, and I love to see the lazy cat! Thanks, Donnalee! As you may see in the next post, she didn’t even abandon her favorite spot on the bed when I flung the heavy suitcase up there beside her! Pingback: But will it all fit in my suitcase? – Let Us Live Like We Mean It! Pingback: I’ve decided! (Mostly…) – Let Us Live Like We Mean It! You’re right to pack for changeable weather, and summer temps lower than you’re used to! Some great outdoor clothing here, and plenty of strong shoes for walking. In hotels of an evening you can always ‘doll up’ a bit, if it suits. Sounds good and should look smart in any restaurant. Pingback: Query re luggage size for Iceland trip – Let Us Live Like We Mean It!